Platypus has been selling soft bottles and reservoirs to the outdoor market for years, so it was a bit of a surprise when we found the reservoir to be one of the weak points of the Duthie. The bite valve doesn’t give as good a flow as the others on test, and requires a bit of experience to get the right amount of force to produce any more than a dribble. The chest harness is far too short, leaving it too tight when maxed out, even for test riders of average build. The storage is also badly done — all the mesh pockets to keep tools in place are inside the main compartment and, while there are a respectable number of them, gaining access requires the main contents to be pulled out. This isn’t helped by the narrow zips, which require some delving into. It is great to see four compression straps, but they are fiddly to unclip, being just hooked-over cord retainers. On the flipside, the pack is very comfortable, thanks to a long back and wide hip belt, with good stability. The hose is retained with a magnet but it lacks the strength to retain the hose over rough ground. 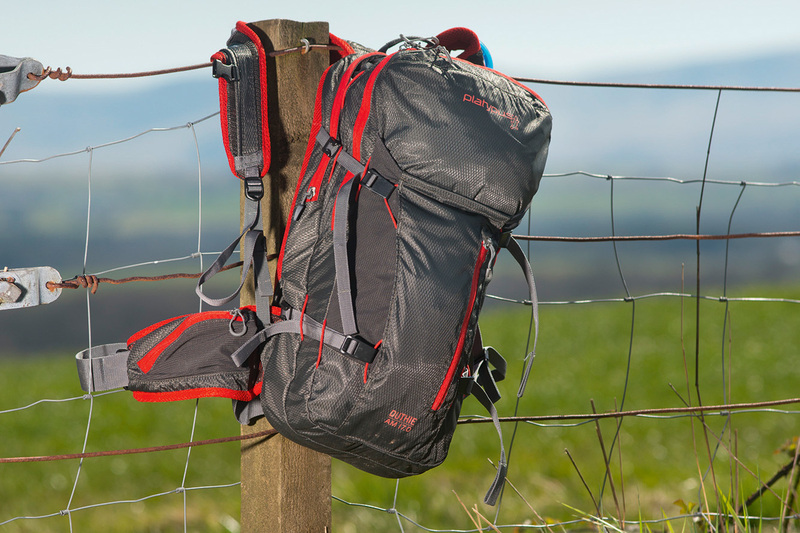 Unfortunately the Duthie is not a tremendously well-thought-out pack for the money.